This will probably sound familiar to most of you... In my home, we have a whole bunch of devices that can be charged via USB (two iPhones, a BlackBerry, an iPod Touch, etc ad nauseam). We also have a bunch of USB chargers, each of which has a single USB port on it. 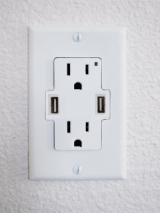 I'd like to have something permanently connected to AC power with at least 4 USB ports on it, so we can just plug devices in and don't need to go looking for a free outlet. I can't say anything about the charging speed (as I left it overnight) but all devices were fully charged this morning. I'm talking about a standard USB hub--those little accessories that multiply one of your PC's USB ports by a factor of four, five, six, or even seven. 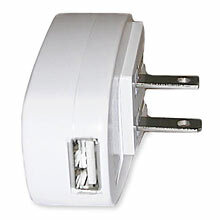 I took a spare seven-porter--the Belkin F5U701 ($20)--plugged its included AC adapter into a nearby wall outlet, and started loading it up with devices. A few minutes later, I was charging six devices via USB with no apparent problems--and I still had a free port available for yet another device. Although the voltage is consistent across all USB chargers (5V), I believe the ampage does vary. I have heard reports that iPhones charge really slowly or not at all using a Blackberry charger. Same with Blackberry chargers, they are not all the same ampage for each model. I would just buy a 4/6-way power surge-protected strip or something and plug all of your existing chargers into that. Although it says "any USB-powered device including ... iPhone", I'm waiting for my pre-order to ship before finding out whether the iPhone 3G and 3GS will be able to charge through this outlet. The 3G and 3GS have special requirements involving an authentication chip from Apple, which are only in Apple-approved products. I guess I'll just have to wait and see! You might want to keep in mind that some hubs may share or divide the amps across the ports, and you may get lower performances, even if only one device is actually connected. You may want to test the actual voltage/amperage with a meter on the ports of the hub. I have never tried with a powered USB hub, but there are USB wall chargers that do exactly what you want. See this result search result of USB wall charges at Amazon.com. Some of those devices specifically mention iPod support. I think I tried one with an iPod Nano and it worked fine. I have used one with a Sansa mp3 player and a Creative Zen. It's basically a mains plug with 4 USB ports. It hasn't arrived yet, but I'll update here when I've tried it, along with information about the devices it works (and doesn't work) with. ThinkGeek: AC to USB Power Adapter -- for a portable solution. Update: You'll get a decent 1-Amp (or more?) adapter from your nearest Apple store. Whatever you do, get a good quality adapter or you might burn off your gadgets! Not the answer you're looking for? 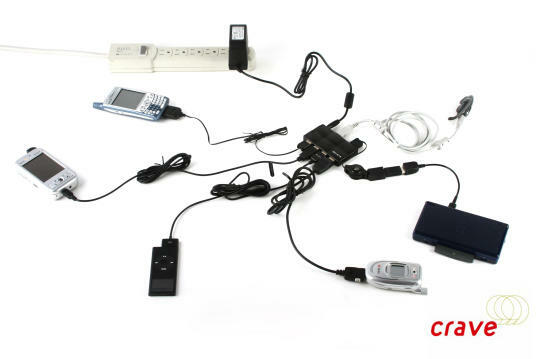 Browse other questions tagged usb power charging hub or ask your own question. Can I use a USB hub to simultaneously charge a tablet and connect a USB drive? Why does the USB hub need to be connected with my PC to charge my Droid phone? Can I power a nexus 7 through a powered USB hub? inconsistent USB connection between mobile and computer - lack of power or faulty hub? Is MicroUSB powerful enough to charge MiniUSB devices?